He-Man and the Masters of the Universe Magazine #4 is the Fall 1985 issue. The stories and activities have plenty of Horde presence – She-Ra was premiering, after all. We’ve got more substandard stories. “The Darkest Day” centers around some “energy sphere” nonsense He-Man whips up with his sword (it’s never even illustrated). At least Skeletor gets some good speechifying in. “The Fight for the Fright Zone,” in which Skeletor and Hordak play a sport called “flashball,” is stupid, but kind of fun. The activities are the usual low-difficulty sort, although there’s a pretty good maze puzzle. 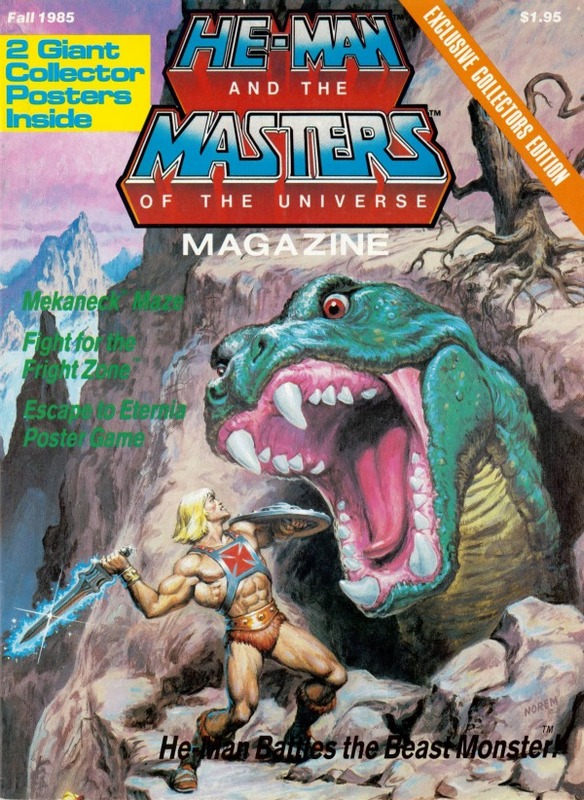 There are two posters included – one is the sweet Norem cover of the Fright Zone Beast Monster Dragon Snake Creature; the other is a Candyland-style board game.